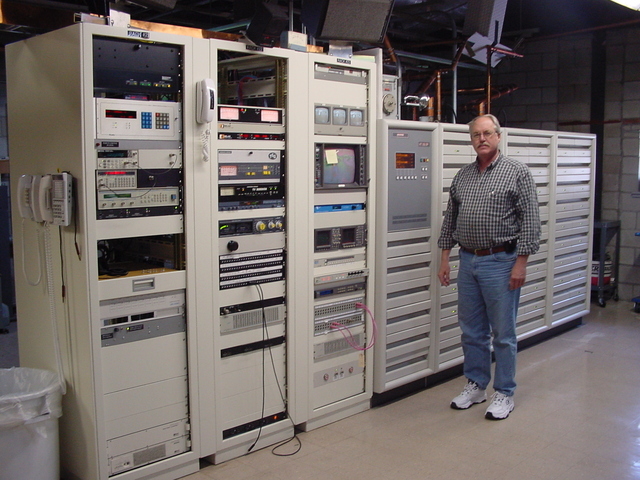 We've now left the DTV building in the case of WGBH's engineer, who is seen standing in front of his new channel 2 transmitter, with the obligatory racks of control equipment. The old channel 2 transmittter was located approximately where I am standing to take this photo; it and all its ancillary equipment were shipped off to another public broadcaster. The old WGBX-TV transmitter was located behind the new channel 2 unit.